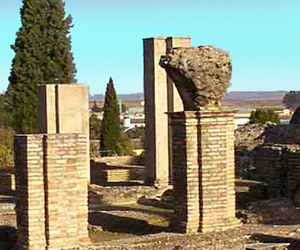 Domus (collegium) of the Exedra (Italica), at Santiponce, Seville. Features of this building are not enough to tell us about its concrete function. It has been seen as a living house -domus-, since it has common features with them. But greatness of the buiding -it occupies an area of 4.000 m 2- and existence of not defined elements makes think it as a "semipublic" building; maybe a private school with a residence for its owners. At both sides of the entry seven tabernae can be seen: they were public shops that surrounded the door. There are two more at the right side and one at the back. Its inner design shows that after the vestibulum at the hall, the fauces gave access to a distributor patio. This peristylum is rectangular. It has an oval fountain at its central axis. Portico perimetral supporting does not need columns, as is usual. Instead of them there were big pillars with a plan with a shape of cross. They should have supported a weight superior to the usual on a private house. Therefore it could have supported one or several superior floors. These pillars had no lintel: they were joined with archs forming an arcade on each floor. 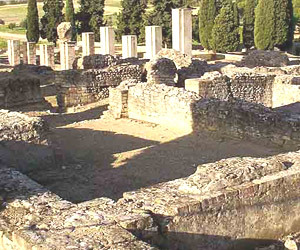 At both sides there are several rooms -cubiculum- that give an original style to the whole domus. One of them has a way out through the right façade. Access to the bottom of the peristylum was made through stairs close to the termae, distributed by an inner patio. Two of the bathrooms are covered by semibarrel vaults. At one of the sides -left from the outside- there is a big rectangular and long palestra -almost the long side of the building- that ends at a big exedra covered with a quarter-of-sphere vault. This area is communicated to the exterior through a corridor perpendicular to the entry at the right lateral. 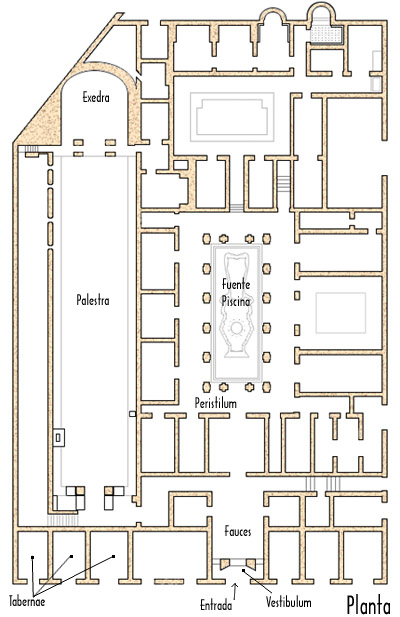 Four big areas can be found at the inner of this building: tabernae, termae, domus and exedra with its palestra.